"This is a very easy and very filling weeknight meal and is easy to switch up depending on what is in the pantry. Toss the potato in the oven, turn on the game, and finish up at half time!" Place the sweet potato on a baking sheet and bake until tender, about 30 minutes. Heat olive oil in a skillet over medium heat. Cook and stir onion, red bell pepper, and chili pepper until very tender, about 15 minutes. 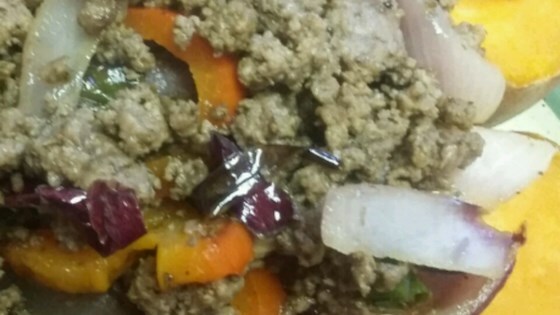 Stir vegetarian ground beef into the skillet and cook until heated through, about 5 minutes. Slice cooked sweet potato in half lengthwise and top with the skillet mixture. Place yogurt on top and season with salt and black pepper. A versatile vegetable medley with marinated meat. I really liked this recipe, it's healthy and tasty. I read other reviews that you can substitute other vegetables so I used zucchini and green onion, that's all I had in the kitchen. Very good! This was very good as written, with some adjustments to our personal taste I think it could be amazing. Next time I think I will add in garlic to the onions and peppers, and a few spices. Yum! Microwaved my sweet potato since its faster, used regular ground beef, and didn't have yogurt. It was great, will be making it again!